As part of our efforts to make the Questionmark Users Conference agreener event than ever, we’re pleased to have selected a hotel that has been widely recognized for its green initiatives. 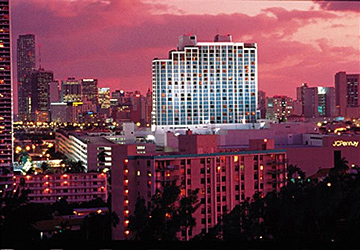 The Hilton Miami Downtown has demonstrated its commitment to preserving resources through its participation in the Florida Green Lodging Program. The program, established in 2004 by the Florida Department of Environmental Protection (DEP) with the intent of recognizing and rewarding environmentally conscientious lodging facilities in the state, is helping Florida’s lodging industry conserve and protect the state’s natural resources. As a Florida Green Lodging Program designated facility, the hotel has formed a “Green Team” that focuses on ways to reduce impact on natural resources. The Green Team’s efforts so far have focused on water conservation, energy efficiency, waste reduction and clean air practices. The hotel has now uses low-flow shower heads and toilets, digital programmable thermostats, energy-efficient lighting and recycled paper products. It also utilizes bulk purchasing and has in-room and vending area recyling bins. There’s a comprehensive recycling program for bulbs, cardboard, paper, plastic and toner cartridges. Clean air measures include the use of high efficiency air filters and the use of environmentally sound cleaning products. We’re also “greening” the conference by reducing the amount of paper we use, decreasing the size of our conference notebooks and making handouts available online. In addition, we’ll reduce our use of bottled water, create re-usable signage and provide recycling bins for badge holders, lanyards and, of course, paper! With the excellent program we have planned for Questionmark users, we expect the conference to inspire participants with new, spring-green shoots for their assessment programs. See you at the conference March 14 – 17! Our $100 earlybird registration ends January 22nd, so register soon!